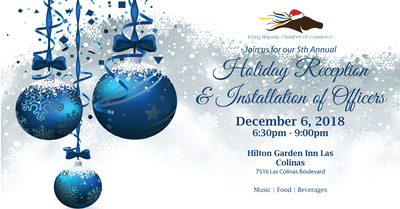 You're invited to join the Irving Hispanic Chamber in celebrating the holiday season and welcoming our 2019 IHCC Board Members. Join us for a fun night of Networking, Music, Food and Beverages! WANT $10 OFF YOUR TICKET? Take $10 off when you bring cans or packages of soup for the students of the Irving Schools Foundation.